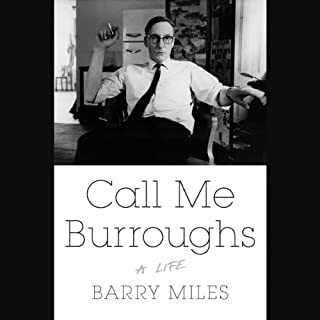 In Call Me Burroughs, biographer and Beat historian Barry Miles presents the first full-length biography of Burroughs to be published in a quarter century - and the first one to chronicle the last decade of Burroughs's life and examine his long-term cultural legacy. Written with the full support of the Burroughs estate and drawing from countless interviews with figures like Allen Ginsberg, Lucien Carr, and Burroughs himself, Call Me Burroughs is a rigorously researched biography that finally gets to the heart of its notoriously mercurial subject. A Complicated Person. A Brilliant Biography. Burroughs was a complicated person. And this is a brilliant biography. I did walk away from it with some of my assumptions in place—that he exploited desperate boys and young men—because of his status. That the root of his famous paranoia was the fact that he was very much the exploitative person he professed to criticize. That he neglected his son and genuinely appeared, at times, to lack empathy. Yet the work also showed that he struggled like anyone else. He had deep friendships and people loved him. The book also explained the biggest mystery to me: why someone who lived in so many amazing places would spend the last 15 years of his life in Kansas. Needless to say, Miles is truly masterful. He presented the information about Burroughs in an oddly contradictory way—both intimate and objective at the same time. And his understanding of how Burroughs life was unfolding at the time of his works was a true gift. Elucidating without dwelling on them in some pedantic way. His explanation of Burroughs connection to painting and how it evolved in his last years was equally insightful. Yet more than anything, this book made me want to write and create. I felt Inspired, which I wasn’t expecting. And perhaps more than that, it helped me see Burroughs as an artist. It dispelled some of the myths that made him an icon. Things I’ve been carrying around since first encountering him. It also made me believe, once again, that cut ups might possibly be interfering with the space time continuum. And for that I am truly grateful. I know this guy would run circles around me. I can also appreciate the fact that he's a genius scientist. 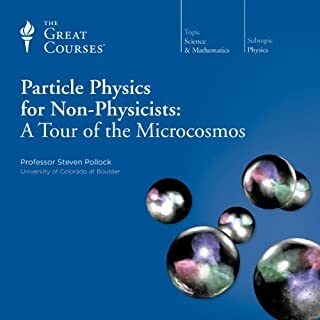 Yet I was really hoping for an in-depth overview on particle physics. Like the specifics. What I got, instead, was the same historical narrative that didn't, frankly, hang together all that well compared to some other versions of it. I feel bad writing that, but you can tell he's having a hard time breaking it down, and when he does, it's nothing new. So if you have not heard the story about Einstein and the light wave and his skepticism about quantum physics and how the atom doesn't really have particles flying around it and so on...it might be interesting for you. Yet if you have learned all that before, I'd pass. These 24 inspiring lectures introduce you to the sages who, as a group, represent the "missing page" of the history of philosophy. Although their names are sometimes familiar to us, as in the case of Cicero and Plutarch, their philosophy is not. Studying these thinkers offers some surprising ways to think about philosophy. This course offers ample opportunity to hear, in their own words, the philosophers' prescriptions for healthier living. Professor Johnson is an amazing and compelling teacher. He takes a subject which is often marginalized in the world of "ideas" and shows its relevance. He shows how these ancient individuals have much to offer our daily lives. Personally, I've been greatly interested in Epictetus for quite sometime. The people who list him as an influence is long. For me that was Ralph Waldo Emerson. Professor Johnson does such incredible justice to him, and I learned a great deal that I didn't know before. If you are looking for something thoughtful, or for something to help you through an especially difficult time or transition, than these authors have much to offer. This is a great starting place to get to know them. There is no doubt that Robinson is extremely learned. He's also a little self-impressed. His style can sometimes catapult you into the stars, or drive you nuts, depending on how well you're paying attention. 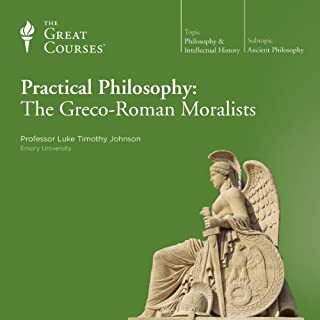 Now, if your looking for a linear take on the history of philosophy, where the lecturer lays everything out according to a strict chronology and a "cause and effect" approach, you would probably do better with another overview. Yet if you're interested in being pulled through 2,500 years of thought according to an extremely erudite professor, who has, mind you, some eccentricity thrown in for good measure, than you will appreciate this approach. In other words, Robinson likes to go for the big ideas. And he likes to spend a lot of time building up to those big ideas. If you're patient and can follow his near-prose style of speaking, it does pay off. 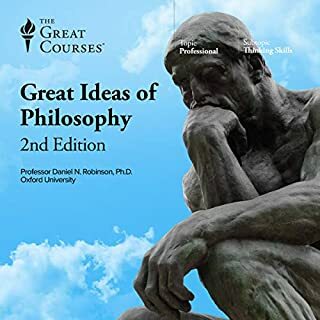 And, to his credit, he's working very hard to set things up so you can have your own epiphany with the ideas, which is what great philosophy professors should do. But then again, sometimes you just want the facts, and you want them laid out clearly and concisely. I sometimes found myself thinking "this is amazing," and other times, I found myself thinking, "ok, yeah, yeah, yeah, think I'll forward to the next lecture now." In all he gave me some great insight, some "great ideas," but I did feel it was a lot of work sometimes, and a lot of highs and lows. Robinson is smart as hell and passionate, and this comes across in many of the lectures. He seems to do a little bit better with modern philosophy, starting with Bacon. You're best off finishing a lecture if you happen to start it.